"Because a beautiful smile is your best first impression"
Advanced Dental Clinic first opened its doors in 1997. For almost 20 years, we have been giving Bay County quality, affordable dental care in a family-focused environment. With the latest technology and experienced, caring dental professionals, you'll love your smile again! Dr. Tarek Elzawahry is a graduate of Boston University Goldman School of Dental Medicine. 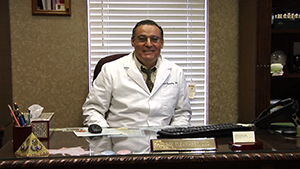 He first opened Advanced Dental Clinic in Bay County in 1997. He had one goal in mind: To provide the most comprehensive dental care in a family-focused environment. Almost 20 years later, our practice continues to give patients the best dental care possible. ​That's because we take great pride in offering the most up-to-date cosmetic dental techniques in a relaxed, friendly atmosphere. Dr. Elzawahry and his staff of well-trained, caring dental hygienists and assistants understand that a great smile is the sign of a job well done. When our patients are happy, we are happy! Dentistry has advanced by leaps and bounds over the years. Gone are the outdated procedures that delivered undesirable results. Now, almost anything can be accomplished with the right technology and know-how. We use the latest technology and our staff is trained and continuously educated on the latest techniques. That, along with our unwavering commitment to you, result in the ideal dental experience for you. You'll immediately feel at ease. During your initial consultation, we will help you map out a complete cosmetic dental plan that achieves superior results. Yvonne Cole, RDH - Yvonne is a multitasker who has been with our practice for 3 years. Not only does she perform dental cleanings, she also helps get your dental insurance claims get filled timely so you can enjoy the most benefits from your plan. Gail Andrews - Gail is our front desk team member and scheduling coordinator. Gail always has a smile on her face and a can-do attitude. Hanan Elkomy - Hanan is our business director and has been with us since 1997. She has bachelor's degree from the University of Florida and a Master's degree from Florida State University.